It has been a few years since this fence was reviewed on Lumberjocks, so I decided to throw in my two cents worth. I own a Craftsman 113 series contractor table saw I purchased new in 1989. It has been a reliable tool, for me, but has always left a bit to be desired. The single greatest issue has been the fence. 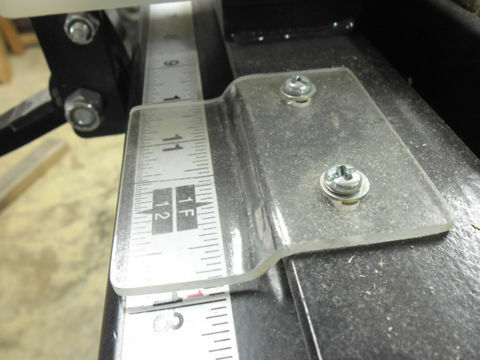 Every rip cut has required multiple measurements from both the front and back of the blade to ensure parallel alignment. While a minute or two might not be a great sacrifice, over the course of a large project, it adds up. To make matters worse, the old fence would shift slightly as I locked it down, leading to burning and inaccurate cuts. Well, after 25 years of that aggravation, I finally sprang for a new fence system. I considered the Vega, the Delta T3 and the Shop Fox Classic. There was a lot of criticism of the fit and finish on the Vega, and it would cost as much, picked up at the Rockler store, as the Shop Fox, shipped to my door. The Delta was not available from a supplier I was familiar with. In the end I chose the Shop Fox Classic. It was a good decision. I purchased this fence system from Grizzly at a price of $275 plus taxes, shipping and handling. It arrived in less than a week and in perfect condition. There wasn’t much to the assembly. I needed to clean the protective gunk off the machined face of the front rail tube. A drill bit and tap were provided to drill and tap the cast iron table top to fit the front and back rails. I chose to drill new mounting holes in the rails, instead. I clamped the rails into position, bolted them in place and mounted the front rail tube. That was it for installation. I did need to make a minor adjustment to the alignment of the fence, but it took only minutes to get it perfectly parallel. I then slid the fence over until it touched my blade, marked the curser position and applied the rule strip provided. Following the guidance in the manual, I took care to not stretch the rule as I applied it. It is at least as accurate as my tape and folding rules. The magnified curser is a bit hard to get used to, but that should just be a matter of developing the habit of looking straight down at it. When in place, the fence locks down securely and predictably, with no deflection when I push against the face. Test cuts on hard maple produced none of the burning I experience with my old fence. The fit and finish of this fence system is wonderful. It is very solidly built. 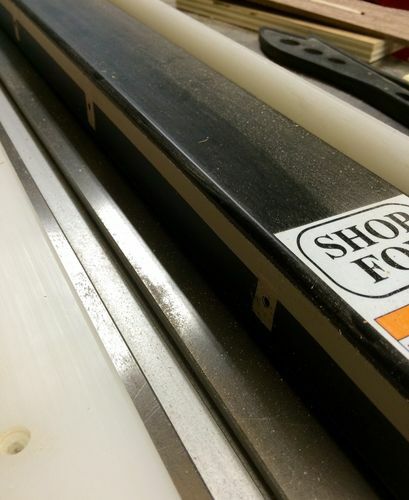 Despite the weight, it glides very smoothly and easily along the guide rails. That has led to the only problem I have experienced. The fence is so heavy and moved so easily that I caught my finger tip in the miter slot as I moved the fence, crushing my finger and leaving me with a black nail and lesson to be more careful in future. I am very pleased with this fence system. It is well made and an excellent value. I am sure that it will let me continue to use my trusty old saw for another 25 years. I have the same fence on a Grizzly table saw. I too was looking at the Delta and was disappointed to find it was no longer available. I’m very happy with this fence, although it’s not quit as good as a Bies. It does flex some when pushed against pretty hard. All my holes lined up but it’s still nice to see them include a tap and drill bit! Nice touch. All in all, pretty happy! I have the same fence on my grizzly G1023RL. I hate it. 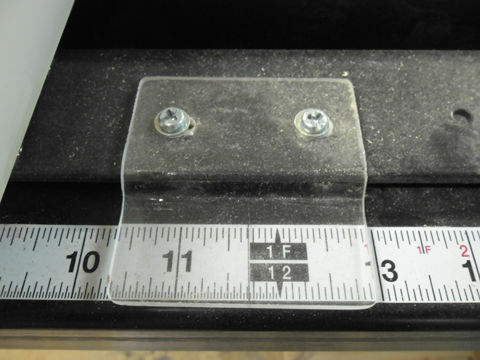 the plastic sides are not straight it undulates along its length. It’s not too big of an issue when ripping a long piece. When ripping a piece under 24” I get a terrible cut because the wood is moving along with the undulations in the fence. I guess my next step is to make some MDF fences. Not sure what you guys mean about the Delta. I just bought one last week for $189 shipped. I installed it last night. I have this on a Craftsman 113 as well, and I am totally pleased with it. That sounds frustrating, Putty. The sides of my fence are quite straight and flat. When I removed them, there was no shimming tape, just the flat sides of the metal core. I’d suggest calling Grizzly customer support to see about having your fence replaced. Drew, I might be able to make the fence flex if I lean into it, but I can’t imagine putting that much side pressure on the fence while actually making a cut. The magnifying cursor got on my nerves as well, I didn’t like the line so far away from the scale. I made a replacement from a scrap of plexi/lexan or some such. Just get it warm with a heat gun and squeeze it between two blocks with the amount of offset you want. Scratch in line on bottom, done deal. I have nothing but praise for the actual fence and can’t believe how long I waited to replace the original. Hope you get years of joy from your upgrade. Drew, I might be able to make the fence flex if I lean into it, but I can t imagine putting that much side pressure on the fence while actually making a cut. That’s what I’ve always thought. It doesn’t move a lick in normal use. Can’t imagine how I would in normal use. Nice upgrade. The 113 can be a VERY capable saw with the right blade and fence. I bet your kicking yourself for not upgrading the fence sooner. I know I did after I installed a T2 on my 113. So yours has none at all? I might remove the tape tomorrow. Nice review. I have that fence too and like it a lot. I don’t know how be 100% of the alignment due to the magnifying bubble. Will replace it with something like soapmaker did. I added a channel for mounting “board buddies” and really like them for ripping long pieces. Definitely adds an extra level of control and safety. I can see why some folks don’t like the bubble—I just close my left eye to set it, and it is dead accurate. I just purchased one Delta 36-30 T3 from Tools-Plus also, arrived yesterday. Under the weather some have not have a chance to look at it. Reading the thread cofirms Grizzly’s reputation more and more. Best of luck with the new fence and reduction in time loss. I bought a Starret tape as it was consistantly give positive ratings regarding accuracy . I used to have the Jet version of this fence and it served me very well. No complaints. I also have a 113 saw (who doesn’t? ), I appreciate this review but have been afraid to take the plunge, been afraid that I couldn’t drill a straight enough hole using a hand drill in the cast iron table or that I would get the holes too high or too low and have a $300 paperweight.